In keeping with my Valentine’s Day theme – sort of – for this week, I give you Carnival. The peeps were in Venice for Carnival a million a few years ago to celebrate their wedding, which was a million many years ago. This year, Venice is submerged. No traipsing through town for me! I’m too short! And that’s a shame, because to hear the peeps tell it, it’s the most magical thing you could ever see. See? Maybe I’ll give them an anniversary gift. Maybe a couple of masques? They could have a 50 Shades of Grey thing going on? Yes? 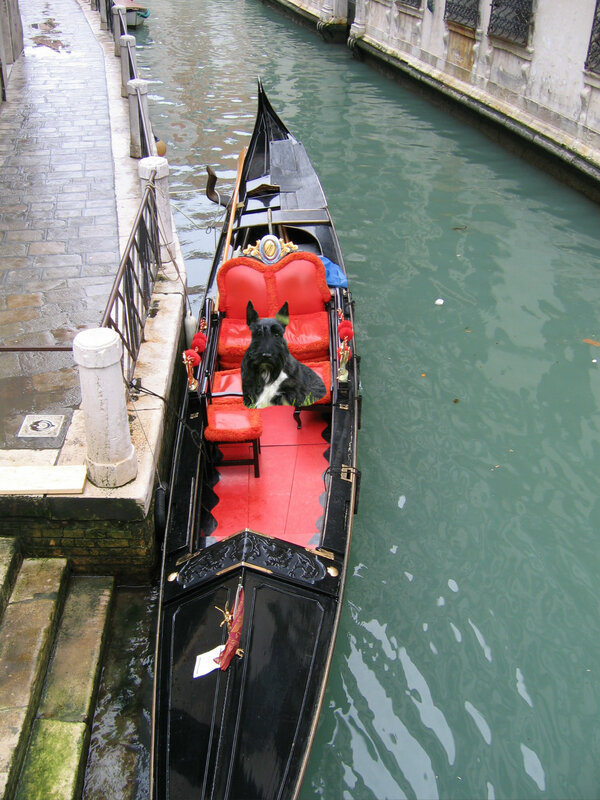 This entry was posted in Scottish Terriers, Terriers, The Scottie Chronicles, traveling with a dog and tagged 50 Shades of Grey, Carnival, Carnival 2015, humor, Italy, love, photography, Scotties, travel, travel photography, Valentine's Day, Venice. Bookmark the permalink. Scary masks! We like the ‘ol Stuart face, naked, as they say. You are too handsome to hide behind a mask! I really don’t like them either. The mask does NOT improve your looks. Nothing could. Really. Don’t you think? SQUAWWWWK! Oh doggies….don’t drown…best leave the water ways to the peeps…now you gots Mom wanting to go there! No drowning allowed. No indeed! Happy Anniversary to your peeps! Stuart, you should forget the masks and remember the life jacket! I’d luv to swim through Venice! That’s what you’d be doing! You’re to young to read that book. You need a life vest if you are on a boat. We are just looking out for you,. I think I’ll skip them both. And concentrate on the food! Momma was in Venice once for Carnival a long time ago. She said the maskers were amazing!